This is a glyph bearing the image of an Ahuizotl, an Aztec water monster, which likely dates from somewhere in 1486 to 1502... which is the reign of the Aztec Emporer who was named Ahuizotl. Not surpringly, he liked to have images of the monster around. If you look closely, you can see the monster's defining feature: a human hand at the end of its tail! The leafy stuff surrounding the monster is a symbol showing the creature is in water, by the way. 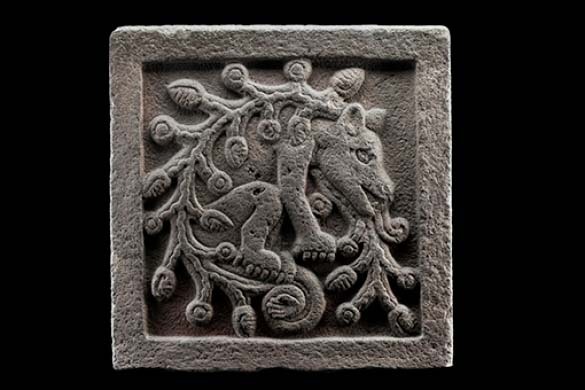 This image comes from the Museo Nacional de Anthropologia website [Link Here], and the glyph itself is on display there in Mexico City, Mexico. Here's a link to a larger image of the glyph provided by Wikipedia [Link Here].